(Bloomberg) -- Carlos Ghosn will remain in jail until at least April 14 after a Japanese court granted prosecutors’ request to keep the former chairman of Nissan Motor Co. longer for questioning on new allegations of funneling millions of dollars from the automaker for his own purposes. The court disclosed its decision in a statement on Friday. The former global auto titan, who once led Nissan, Renault SA and Mitsubishi Motors Corp. at the same time, had been free on bail for almost a month following a 108-day stint in a Tokyo jail. Prosecutors rearrested him on Thursday on fresh charges, saying they detained him because they thought he might destroy evidence. 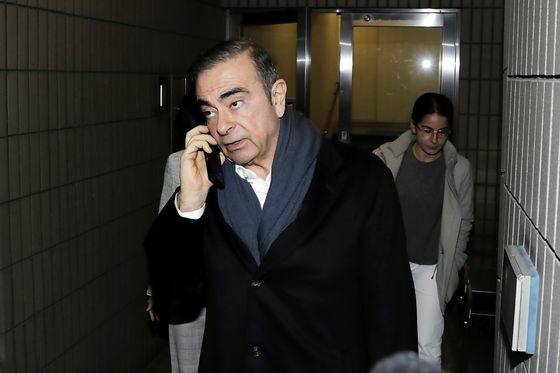 The arrest spoiled Ghosn’s plan to hold his first post-detention press conference on April 11, during which he said he will “tell the truth” about accusations against him. Another lengthy stay in prison could also make it harder for the former auto executive to prepare for his trial on charges of financial misconduct, and refocus international attention on Japan’s criminal justice system.